See Time Commander Screenshots Here! NEW! - In collaboration with software developer Sentier Systems Inc of Windsor, Ontario we are pleased to recommend and offer TIME COMMANDER - a detailed labour tracking software that will prove beneficial to any industrial facility although our interest is to promote to the moldmaking industry. TIME COMMANDER can be used as an add-on to your existing ERP/MRP system currently in place or a good start for a smaller company thinking about ERP systems, but not quite ready to make that leap yet. More accurate estimates by comparing actual labour versus estimates for past jobs. All installation, support and invoicing is handled by Sentier Systems Inc. separately from any ToolQuote installations. 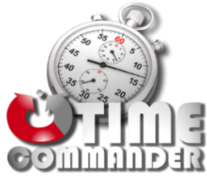 JDL Technical fully endorses the usage of TIME COMMANDER for job tracking of any kind.